According to the 2016 National Retail Security Survey, US businesses lost around $45.2 billion in 2015 to retail theft, more than 1.38 percent of overall sales, making retail theft one of the leading issues facing retailers today. According to the National Association of Shoplifting Prevention (2006), more than 9 percent of consumers are shoplifters. They are apprehended, on average, only once in every 48 times they shoplift. There are many types of retail theft, which can be measured by calculating the loss from employee theft, shoplifting or organized retail crime, administrative errors, vendor fraud, and return fraud. Offenders also vary in their level of experience, motivation, and method of shoplifting. Most shoplifters can be categorized as either amateurs (opportunistic) or professionals (highly skilled). Amateurs are typically driven by personal use or desire for a product (e.g., food, clothing, or status) and shoplift when they perceive little or no risk. The amateur is usually cautious and apprehensive. A significant percentage of all retail theft is conducted by professionals, often working in pairs or as part of a larger network or retail crime ring. The professional, often called a booster, is much more ingenious than the amateur. The professional is skillful and blends in so as not to attract any attention. The professional may have a “hit list” of very specific, small, high-valued items for which there is a high demand on the black market. Generally, the professional is vigilant and steals for a living. Some amateur shoplifting occurs simply due to opportunity, while other shoplifting events are detailed crimes that are well organized, thus harder to prevent. Organized retail crime rings (ORC) generally include a network of individuals who serve as: (1) boosters—individuals who act as professional shoplifters who work either alone or in groups to steal the goods, (2) handlers—individuals who sell the goods to fences, and (3) fences—individuals who purchase the stolen goods at a reduced price. Generally, a booster is provided with a fence sheet, a list of hot products to be shoplifted, and the number of items requested. Hot products are more often targets on a booster’s shopping list because of the effortlessness with which they can be shoplifted from stores and converted into cash. More specifically, some hot products that organized retail crime rings target include: 1) Grocery items- infant formula, laundry detergent, cigarettes, teeth whitening strips, energy drinks, and high-end liquor, 2) Over-the-counter medications – allergy medicines, pseudoephedrine-based cold medicines, weight loss pills, diabetic testing strips, and pain relievers, 3) Health and beauty items – pregnancy tests, high-end lotions and creams, razor blades, and electronic toothbrushes, 4) Electronics – cell phones, digital cameras, printer cartridges, GPS devices, lithium batteries, laptops, tablets, video games, and televisions, 5) Clothing – designer brands, handbags, and denim, and 6) Home goods- high-end vacuums, mixers, blenders. Data is pivotal to assess and improve loss prevention tactics. Risk analysis can be used to allocate resources effectively, since knowing how much to spend and on what to spend is pivotal when facing limited capital. For example, using and analyzing transaction and inventory data can allow us to understand shoplifting patterns, shoplifted products, high-loss stores or regions, and effective tools and, ultimately, to predict future shrink in stores. Data can also aid in the identification of organized retail crime rings via fraud ring analysis. People tend to group together based on similarities, and this is particularly true among criminals. This behavior is particularly useful for detecting organized retail crime rings. 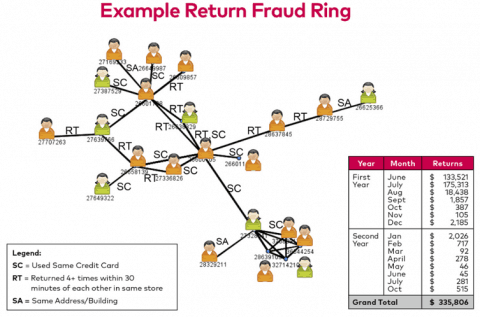 Fraud ring analysis is a method of identifying organized retail crime rings by first identifying high-risk consumers, and then mapping out clusters of similar consumers (or aliases) and analyzing their transaction behavior (see Figure 1). Using linking algorithms, loss prevention analysts can connect known fraudsters to other dubious consumers. Often, uncovering clusters of associated identities that constitute either crime networks or aliases of the same criminal provides a more complete view of the types of fraud affecting shrink. Employee theft pervades the retail industry. It was the second leading cause of shrink in 2015, accounting for one-third of retail loss and equating to $16.2 billion annually. According to the National Retail Security Survey, the average loss from dishonest employees was $1,234. An employee may void transactions and pocket the cash. A cashier can ring up a reduced price on a product to hide theft from the till. A cashier may overcharge a customer and pocket the difference. An employee may hide stock in trash bins, and collect it later. An employee may save customer receipts and use them to “return” stolen products. An employee may process a fake return, steal the money, or credit his or her own credit card with money allegedly paid back to a fake customer. An employee may process a return for a larger amount than the amount of the product and pocket the difference. An employee may forge inventory logs. An employee may falsely use employee discounts. An employee may assist friends or family members in theft (i.e., sweethearting). In many cases of internal theft, a proper control (i.e., guardianship) is not in place. That said, there are a number of steps that can be taken to prevent and catch employee theft. First, security cameras, management oversight, vigilant controls over the cash drawers, and encouragement of anonymous tips are pivotal to reducing internal theft. Second, the ability to isolate and quantify the various kinds of internal theft with data and translate it into proactive strategies that will prevent loss is critical. Initially, leveraging company-wide data and conducting a rigorous analysis, down to the store and employee level, can help identify concealed fraud and limitations in the control environment. Third, statistical methods can be used to proactively detect abnormal employee behavior. One method for analyzing employee fraud is through outlier detection. An outlier is simply an observation (in this case, a transaction) that is far outside the norm. When using outlier detection, it is the goal of the analysis to identify employees, products, and stores that are not behaving like their peers. Return fraud is a type of crime that occurs when a customer defrauds a retailer via the return process. According to the 2015 Organized Retail Crime Survey (Cantrell & Moraca, 2015), 66 percent of retailers surveyed have experienced the theft of merchandise which is then returned for store credit in the form of gift cards that are sold to second¬ary market buyers and sellers for cash. Other forms of return fraud include wardrobing, receipt fraud, and price arbitrage. Although return fraud is not typically included in shrink estimates, studies have shown a correlation between shrink and return rates; also, return fraud could have a substantial effect on shrink rates (Speights et al., 2012). Speights et al. (2012) conducted an in-depth study of seven major retailers and more than 7,400 stores and results indicated that as return rate increased, shrink also increased (see Figure 2). In conclusion, before implementing any loss prevention strategy or solution, retailers should understand both the costs and associated benefits of using a specific technique. Controlled tests, followed by statistical analyses, aid this understanding. Using experimental and control groups of stores—and tracking key metrics, such as shrink, sales, employee turnover, return rates, and other important outcomes, in before-during-after analyses—loss prevention professionals can accurately calculate a given strategy’s return on investment. Controlled trials also let analysts manipulate elements that make up an overall strategy by correlating changes in strategy with changes in the return on investment, to optimize loss prevention policies. 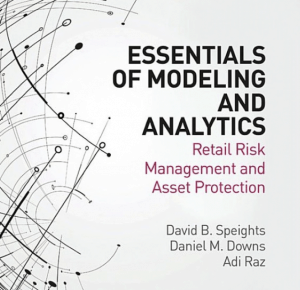 EDITOR’S NOTE: This post has been excerpted/adapted from the authors’ text, Essentials of Modeling and Analytics: Retail Risk Management and Asset Protection. Learn more. Speights, D., Downs, D., & Raz, A. (2012). Shrink Exposed: New Studies Show Return Rate Impacts Shrink. LP Magazine. Losspreventionmedia.com. This post was originally published in 2018 and was updated October 31, 2018.